This Friday, Purple Revolver are making a Liverpool zombie movie trailer and this is an open casting call to all vegans and veggies this Hallowe’een. Would you prefer tofu and grains to guts and brains? You can imagine that nipping to Sainsbury’s for some Quorn isn’t an easy for the undead. Subway Salad? Think again. Met with screams of terror at every corner and facing exclusion from their human-hungry peers, animal loving vegan and vegetarian zombies lead a sad, sad existence. Coming this Friday, we’re staging a zombie flash mob with an undead army taking over Liverpool city centre in aid of Alder Hey children's hospital. But we’re also after a slightly unorthodox zombie to talk about their distaste for human meat and share how veganism has affected their life after death. SFX make up guru Shaune Harrison will be there to share his specialist knowledge in an exclusive Q&A session. Shaune has worked on some huge hollywood films including Star Wars, Harry Potter and The Avengers, so he’ll have some top tips for all budding make-up artists and thespians. With our team of professional make up artists to transform you for just £5 – and proceeds going to Alder Hey Children’s Hospital. For your flesh-eating friends, there will also be drinks offers courtesy of 92degrees Café so come along, bring some mates and let’s get gruesome. 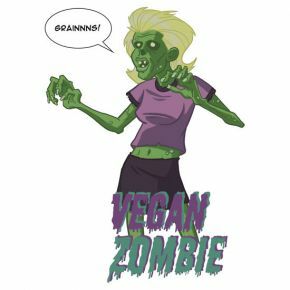 To become our long-suffering vegan zombie - simply mail us: shots@purplerevolver.com and mark your email Quorn of the Dead. We will need you during the late afternoon for make up and then filming outside Matta's on Bold Street.